Last week, Astroworld would have turned 50. Houston's longtime (and much missed) theme park entertained kids of all ages until its closure in 2002. Octanes frontman Adam Burchfield was among those teens who had season passes for Astroworld and still relishes those memories. After all, the guitarist/singer grew up within walking distance to the theme park and experienced some of his first concerts at its Southern Star Amphitheatre. "I remember going with my mom to see Air Supply, and later, I saw Kenny Loggins there too," mused Burchfield. This week, he'll return to an amphitheater setting. Instead of being an awestruck adolescent in the audience, Burchfield will take the stage at Discovery Green alongside his band, the Octanes. It will be the second time the group has performed as part of the University of Houston-Downtown's Thursday Night Concert Series. On June 7, the group shares the bill with rockabilly legend Rosie Flores. The event will be presented by UHD's College of Public Service. The Octanes will take the stage at 7 p.m., followed by Flores at 8 p.m.
Burchfield is a native Houstonian but now makes his home in Austin. Still, members of the Octanes reside in the Bayou City and the band maintains a steady presence on its music scene. 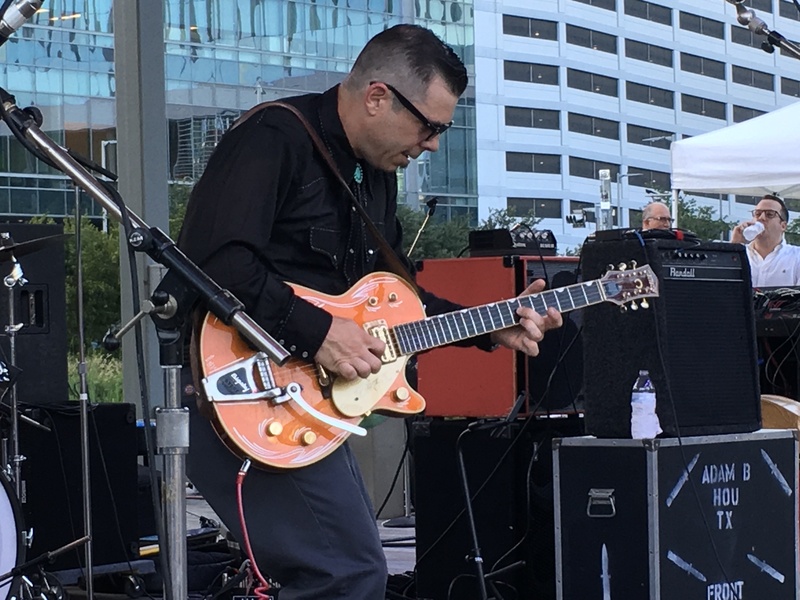 With a penchant for vintage rock, Burchfield leads the Octanes through guitar-charged tracks that will no doubt have the Discovery Green crowd on its feet. Blending blues, honky tonk and rockabilly, the Octanes are definitely cool blast from the past. Aiding Burchfield is his collection of Gretsch guitars. A number of legendary musicians have played these hollow-bodied six strings, including Elvis Presley, Bono, George Harrison, Brian Setzer and others. Burchfield has the distinction of being endorsed by the guitar manufacturer and plays each instrument with a sense of pride. His precision playing and crisp voice (punctuated by a Texas twang) help shift each Octanes' tune into overdrive. From the sleek rockabilly of "Brandin' Iron Blues" to the raucous rocker "Can't Be Friends," Burchfield and company make no secret of their passion for an era defined by hot rods and hoop skirts. UHD News caught up with Burchfield to talk about this week's show and the Octanes' music. UHD News: Why do you think the rockabilly and roots rock continues to be so popular? Burchfield: It's just real. If you listen to the beat, the rhythm … even the keys the songs are in. The songs are simple. Put all of that together with lyrics that people can relate to, and they're hooked. UHD News: You were at last year's Thursday Night Concert Series. What makes these outdoor shows so special? Burchfield: Playing with the skyline behind you is great. And that grassy hill at Discovery Green is a neat, serene place for the audience. It (Discovery Green) has become a Houston staple in a short amount of time. And, the sound is awesome. It has a very Houston feel to it. UHD News: What advice do you have for aspiring musicians? Burchfield: I'd say, play for fun and play to amuse yourself. Listen to other players. Build up a good reference point and learn from the greats. Imagine that one day you'll be able to play for an audience and maybe even get paid. I used to think there was Poison and Guns n' Roses on MTV, and me playing in my bedroom. I never thought about taking my guitar playing out of my bedroom until my mom encouraged me. UHD News: For those who are new to the Octanes, what should they expect at Discovery Green? Burchfield: You'll hear something good to your ear. The music will pull you in, and you'll be able to relate to it. It's a fun show to watch. You might think to yourself, 'That's a spectacle!' We'll definitely give you something to listen to that's enjoyable.